Do you squint while reading or working on the computer? Do you struggle with depth perception when playing tennis, reaching out to hit that tennis ball? If you are noticing constant eye strain or headaches along with blurred or double vision, you may have a condition called amblyopia. Amblyopia, or better known as “lazy eye”, is a common eye condition where decreased vision occurs in either one or both eyes due to abnormal development of vision in infancy or in childhood. Simply stated, amblyopia happens when the vision in one of the eyes is reduced because the eye and the brain are not working together in harmony. Most people don’t even know that they have amblyopia and almost 3 percent of the population suffer from the condition. If you or a loved one is noticing symptoms of amblyopia, Edwardsville-based Vision for Life can help! There are various types of amblyopia and they are: strabismic, deprivation and refractive. Strabismic amblyopia develops from the misalignment of two eyes, during which one eye may turn up or down, in or out. Deprivation amblyopia results from a cataract, which is a physical obstruction of vision. Refractive amblyopia is caused by the inability of one eye to focus as well as the other (farsightedness or nearsightedness). Amblyopia affects individuals of all ages. It is the most common cause of decreased vision among children, teenagers and middle-aged adults. Adults, like children, can be treated with this condition. At Vision for Life, we have successfully treated patients of all ages with amblyopia. Another misconception about amblyopia is that surgery can treat this condition. No matter what the cause and what type of amblyopia symptoms may exist, surgery will not fix amblyopia. Fortunately, vision therapy can treat amblyopia at any age. If you are an adult who is suffering from these symptoms and believe you have amblyopia, you should schedule an appointment with us for a complete vision evaluation. Other common symptoms in addition to depth perception and headaches may include tilting of the head, closing one eye to see or read clearly, a wandering eye, and eyes that are itchy or watery. When your depth perception is being compromised, it’s difficult to perform everyday activities like driving and walking steps. When your schedule is packed with “to-do’s”, it’s hard to get anything done with strained eyes and recurring headaches. Vision therapy can help get your vision “back on track”, eliminating the symptoms and challenges you may be experiencing from amblyopia. 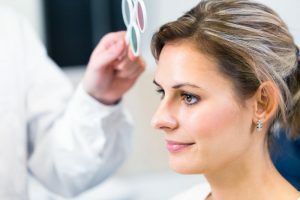 We are able to offer a comprehensive eye exam to detect your condition, performing specific visual acuity testing that will diagnose your vision concerns. If amblyopia is the diagnosis, Vision for Life will develop an individualized therapy program to treat your condition. Our vision therapy consists of simple and concise exercises that will encourage both of your eyes to work together with the brain equally. We also utilize specialized, cutting-edge computer and optical devices, such as therapeutic lenses, prisms and filters along with Vivid Vision, a specialized virtual reality program specifically designed to treat amblyopia, to strengthen the weaker eye’s connection with the brain. Syntonics therapy, a treatment that uses colored light produced by a small lamp, has been extremely successful treating our patients. Most clinics rely on eye-patching alone and research shows it’s not as effective in treating amblyopia. With our vision therapy program, your newly acquired vision skills will be reinforced through repetition and integration with motor and cognitive skills. At Vision for Life, we believe your health and well-being is paramount, and making an appointment with us for an eye exam is an important step in seeing clearly again. If amblyopia is left untreated, permanent vision loss can be a result. It’s not too late to get treatment! Serving patients of all ages, Vision for Life can help correct your amblyopia. Give us a call now at 618-288-1489.